“A samovar (Russian: самовар, pronounced [səmɐˈvar] - literally "self-boiler") is a heated metal container traditionally used to heat and boil water in and around Russia, as well as in other Central, South-Eastern and Eastern European countries, in Iran, Kashmir, Turkey and Hadhramawt eastern Yemen. 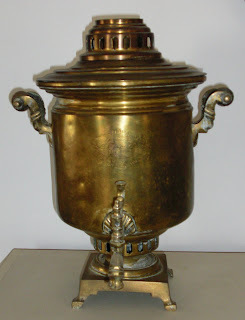 The samovar was an important attribute of a Russian household. Samovars are a part of the traditional Russian tea culture. The Russian expression "to have a sit by samovar" means to have a leisurely talk while drinking tea from samovar. Concentrated tea is poured from a teapot in tiny amounts into a cup. Then hot water is added from the samovar to dilute the tea to the appropriate strength. What do you get when you play at the Bedford Farmer's Market? Some great organic and homemade food of course. A good time. New friends! Please meet artist, Suzanne Whittaker. We met at the Farmer's Market and then I played music at her opening. This is another reason why I love Farmer's Markets! In 1981 I joined an all-woman’s rock band. When I auditioned I had no idea this band was comprised of only women because of a Jewish religious ruling or “Halachah” known as "Kol Isha". In 1981 I was only beginning to understand and identify myself as a Jew, let alone and observant one. I had studied for six months at the Pardes Yeshiva in Jerusalem, and because my boyfriend at the time had become observant, I also tried to live accordingly. Rituals and ceremonies were not my style and I soon returned to a “secular” lifestyle.